Born on this date: Maclyn Arbuckle in 1866; Cullen Landis in 1896; Frank McGlynn Jr. in 1904; Eddie Dean in 1907; Susan Cabot in 1927; and Vince Edwards in 1928. Classic Movie Daily subscribers will find clippings and images related to today's birthdays and television schedule inside today's Daily. —11:30 am - Dead of Night (1945). One of my favorites to watch around Halloween. Favorite episodes include, no surprise, the Haunted Mirror and the Dummy stories. I never cared for the Dummy episode of The Twilight Zone, which I knew before I knew this movie, so I can recall a general lack of excitement the first time I watched this. Until I watched it. Creepy stuff for 1945. I could honestly do without the Golfing story, it's kind of silly, but even it has grown on me due to repeated exposure. —8:00 pm - 5:30 am - Outstanding evening of (mostly) 1950s science fiction under the "Alien Invasion" heading. The evening plays out like so: Earth vs. the Flying Saucers (1956 - 8:00 pm); It Came From Outer Space (1953 - 9:30 pm); The Day the Earth Stood Still (1951 - 11:00 pm); The Man From Planet X (1951 - 1:00 am); Invisible Invaders (1959 - 2:30 am); They Came From Beyond Space (1967 - 3:45 am). I don't think TCM plays The Day the Earth Stood Still very often, as it is a Twentieth Century-Fox title. It's also the best of the this bunch, though I am extremely partial towards Earth vs. the Flying Saucers, one of those movies that grabbed me by the throat when I was a child. My dad, a '50s sci-fi buff, got me to sit through a lot of lesser movies by starting out with this one and instilling hopes that they'd all be like this. None of them were like this! Still my favorite Ray Harryhausen, who also never quite lived up to this one for me. I like '50s sci-fi and I like Harryhausen, but I love Earth vs. the Flying Saucers! —Summer of Darkness returns to TCM Friday morning at 6:00 am with Follow Me Quietly (1949). —GetTV is making a bid for regular coverage with another strong day of programming. It begins with The Lone Wolf Spy Hunt (1939), the first of Warren William's Lone Wolf entries. Worthwhile, but my least favorite entry. But it's got Ida Lupino and Rita Hayworth! Rita is fine, but Ida grates on my nerves, though not as much as Virginia Weidler, who I usually like. Also, no Eric Blore yet. Still, worthwhile. —From 7:00 pm - 1:10 am GetTV plays four of the Boston Blackie movies starring Chester Morris. Titles are Alias Boston Blackie (1942 - 7:00 pm); Boston Blackie Goes Hollywood (1942 - 8:35 pm); Meet Boston Blackie (1941 - 10:15 pm); and Confessions of Boston Blackie (1942 - 11:40 pm). 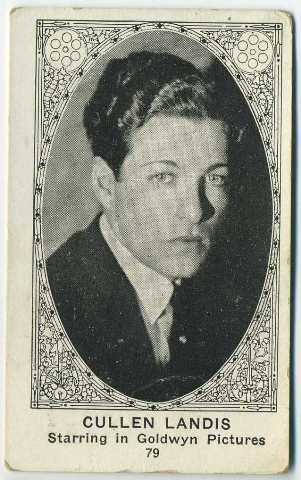 More on Blackie in my Chester Morris biography. —I've decided to cut out weekend editions of the Daily beginning this week. With the option to put together a weekend issue if the notion strikes me. I love doing this, but I've gotten nothing done this week compared to last week's vacation schedule. So we'll go with a Monday-Friday schedule for awhile, and neither of us should be as overwhelmed as we have been. We can both get caught up over weekends. —That will help stretch the birthdays too. Speaking of birthdays, and nothing personal against those names at the top of the page, but a bit underwhelming today. I went through my calendar again just to make sure I hadn't missed anybody the first time I did it, and all I could add were Maclyn Arbuckle and Eddie Dean. Tomorrow is a bit more star-studded. —Frank McGlynn Jr. was born on this date, but I've got some stuff on his father, Frank McGlynn Sr. inside today's Daily. Think Lincoln. I don't know what we'll do on Senior's birthday, other than now hope it falls on a weekend. —Another of today's clippings posts spotlights the brief Margaret Sullavan-William Wyler marriage. Consider it residue of The Good Fairy review, which I'm planning to complete for tomorrow. If I don't finish it up in time for tomorrow's Daily, well, that will probably make this Saturday the first exception to the new rule just unveiled above. Hey, we're keeping it footloose and fancy-free! —eBay was running a free listing promo, so I've bulked up my total number of items listed to over 3,000. That means additional sales items as well. My sales items, currently discounted 35-60%, can be found through THIS LINK .